I often get asked what my laundry routine is. I don’t have a magic schedule. Actually my routine is quite simple. I have tried so many laundry schedules recommended by others and they have never worked for me. The only tried and true method that works for me is to wash a load of laundry EVERY SINGLE DAY. It’s that simple. I don’t like to see laundry pile up so the “one load per day” method eliminates that problem. I wash our bedding on Saturdays and I take Sundays off. How do I do it? My best tip is to teach your children how to wash their own laundry. Trust me, they are capable and it won’t hurt them one bit. It will teach them responsibility. Teach them as early as possible. My two kids that still live at home are 11 & 16 years old and I also have a 16-year-old German exchange student. They each have one laundry basket in their closet. They wash their own clothes once a week, whatever day works for their schedule. They typically have about three loads of laundry to wash every week. They even wash their own towels and washcloths! I purchased different color towel/washcloths for each kid so there’s no confusion as to who’s it is. My daughter uses pink, my son uses gray, and our exchange student uses navy blue. My husband and I both use white. Another part of my laundry routine is to take care of our Maytag washer and dryer, so they can help us power through our loads. A part of that is cleaning them regularly. I know people struggle with this but it’s really simple to do. To make it easy to remember, simply clean your machines on the first day of every month. (Mark your calendar if you forget). We recently got a Maytag top load laundry set for our new home. 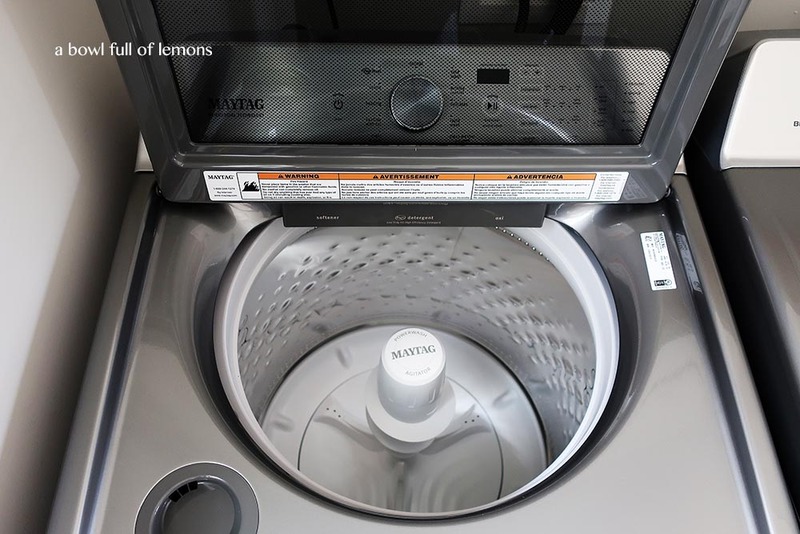 The washer is the #1 rated top load agitator washer (model #: MVWB865G) by a leading consumer magazine. If you’re curious about the difference between agitator vs. impellor models – use this! And if you’re in the market for a new laundry set, get deals from Maytag before they’re gone by visiting www.Maytag.com/November! 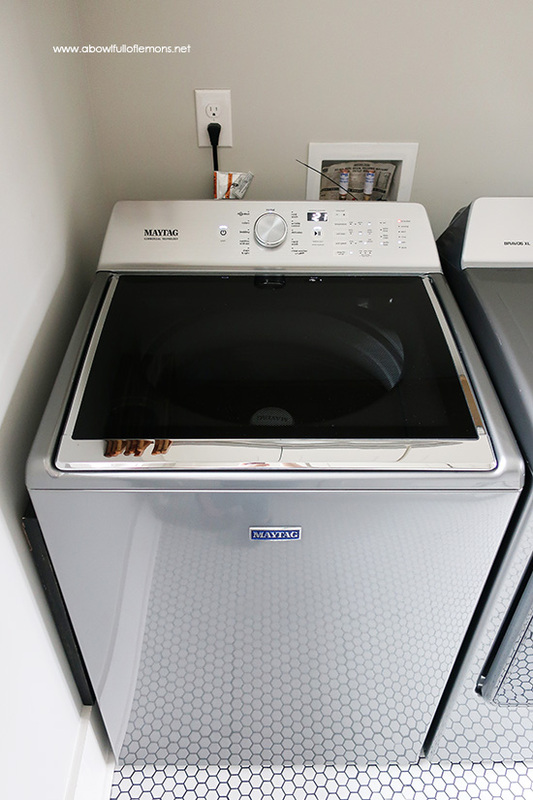 Our Maytag washer has a cycle called “clean with affresh” (although you don’t need Maytag appliances to use this cleaner). 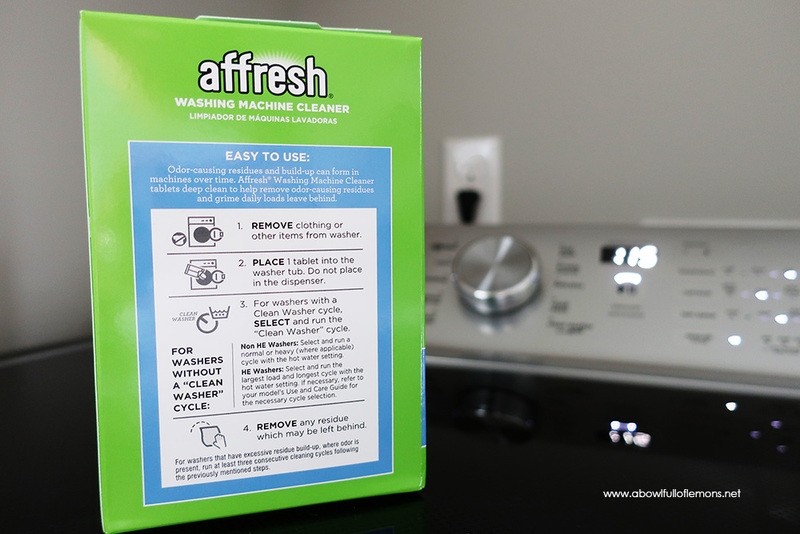 Affresh recommends cleaning your machine once a month or every 30 wash cycles. Easy peasy! 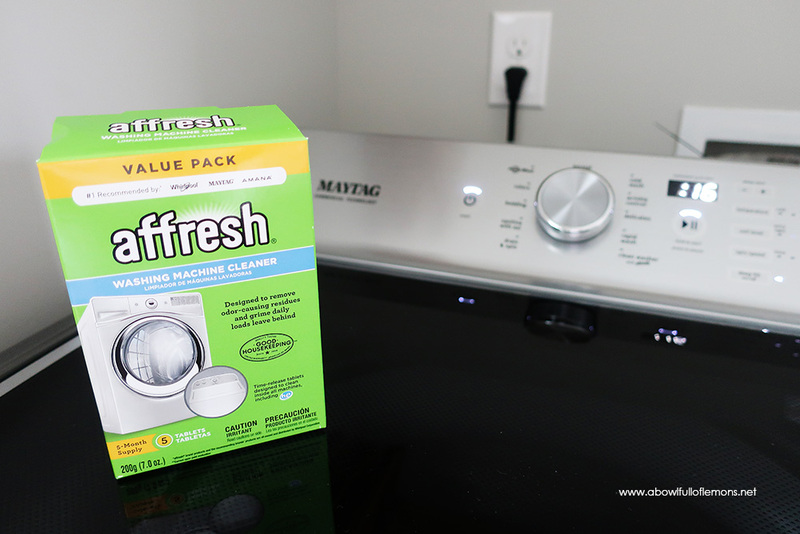 To clean your washer with affresh, simply turn on your washing machine, select the “clean washer with affresh” setting (or the fullest & hottest setting), place a tablet in the drum, and press start! That’s it. While the cleaning cycle is going, clean out the dryer lint trap and dust behind the units, to remove the lint. Once your cleaning cycle completes, take a damp microfiber cloth and wipe down the unit really well. Take out the soap dispenser and rinse it clean and wipe down the lip of the drum. Wipe away any residue left in the drum as well. If you have a front load washer, follow the same directions. If you don’t have affresh, simply add a cup of bleach to the drum and run the hottest setting. 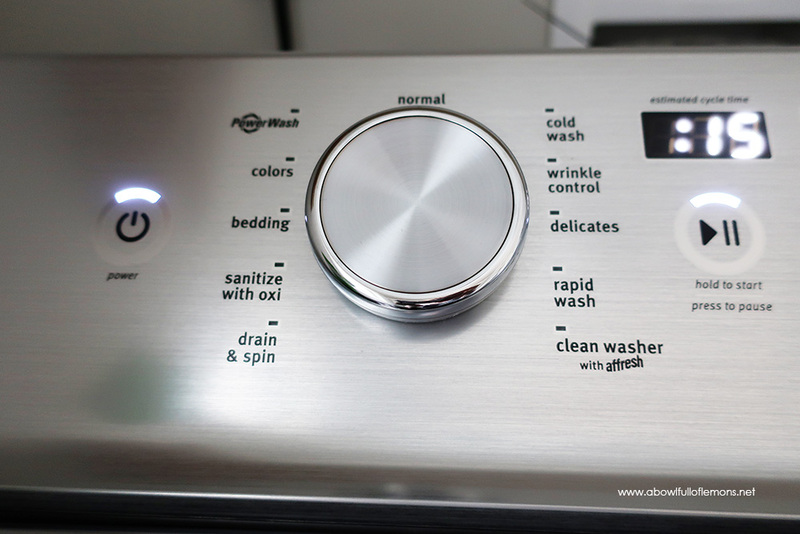 No matter how clean your washer and dryer may be in the inside, you still need to know the best way to wash everything! 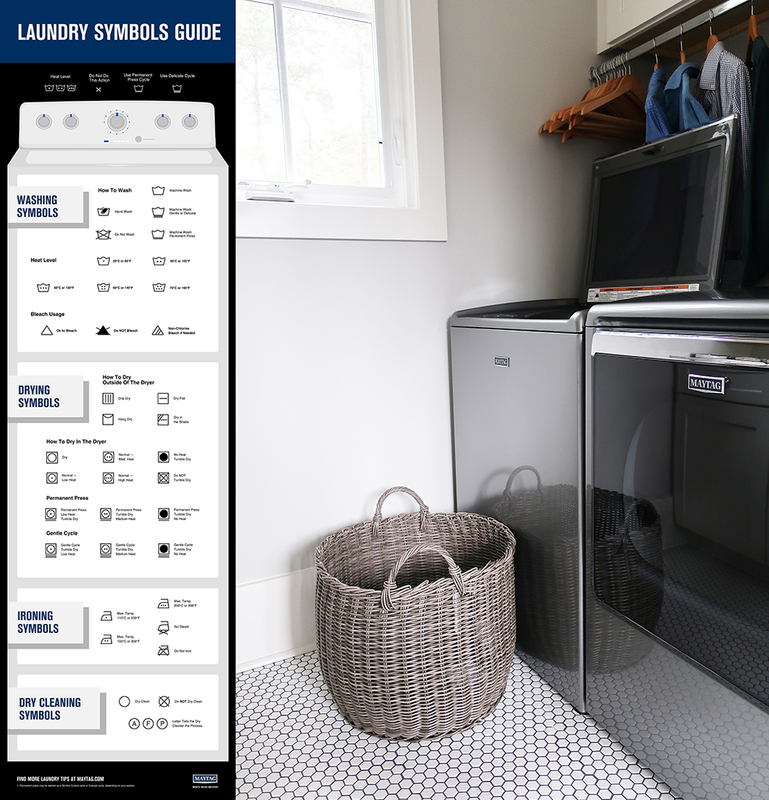 Deciphering all those laundry symbols on the tags of your clothing, comforters, etc. can be confusing and stressful. I’ve included a photo below with a great guide to help you correctly care for your clothes. I wash our bedding on Saturdays. My kids wash their own clothes, towels, and bedding, once per week. I clean the washer and dryer once a month. 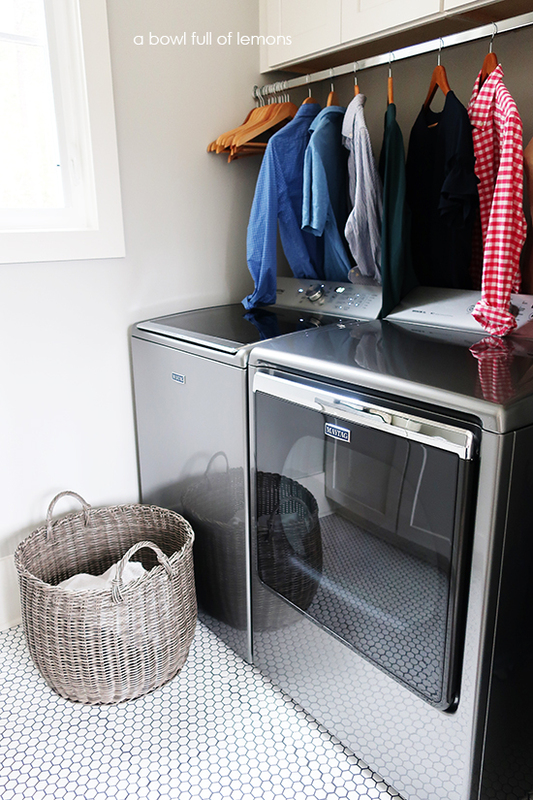 If your laundry room is a mess and your clothes are in piles all over the house or maybe you often feel overwhelmed with laundry, try these tips for one month. 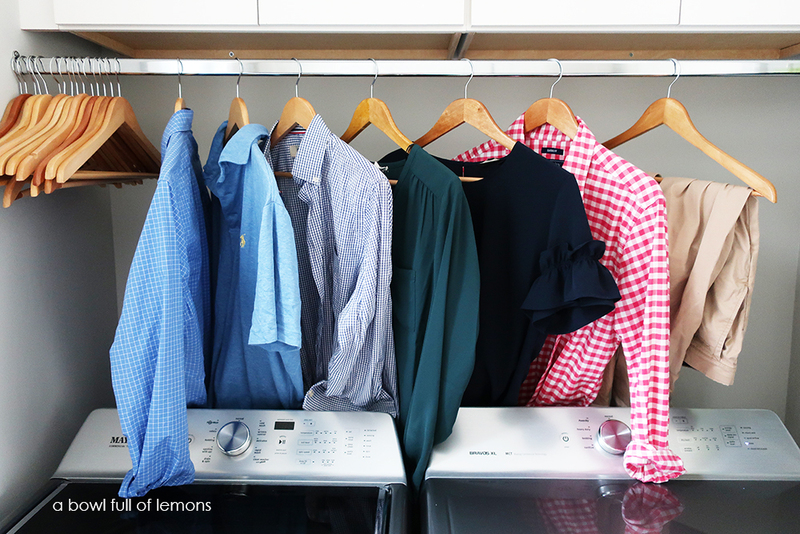 I think you will begin to feel the weight lift off your shoulders and regain control of your laundry routine. Trust me, it’s a great feeling. 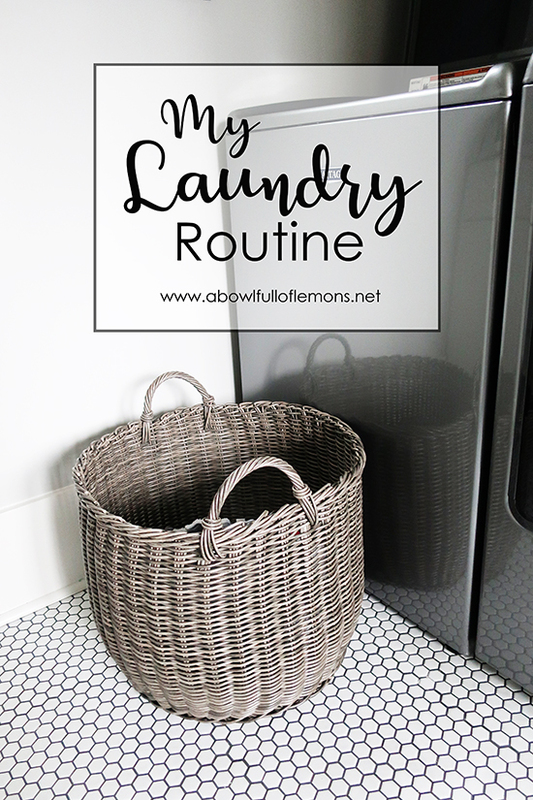 Be sure to check out my laundry room organization post and video here. Disclaimer: This post is sponsored by Maytag®. All opinions are my own & I only recommend products or services I use personally and believe my readers will enjoy. All opinions are my own & I only recommend products or services I use personally and believe my readers will enjoy. I am disclosing this in accordance with the Federal Trade Commission’s 16 CFR, Part 255: “Guides Concerning the Use of Endorsements and Testimonials in Advertising. Please click here for full disclaimer.